Nice, this was mine at Anime North last year! The wig was all the one shop they had! You should just do what I do and buy stuff online. eBay has a ton of great cosplay materials. Only downside is that things like wigs are often made/shipped from China, so they take 10-15 days to arrive in the US. I found a much better shirt (again, on eBay) and got some nice ears as well. 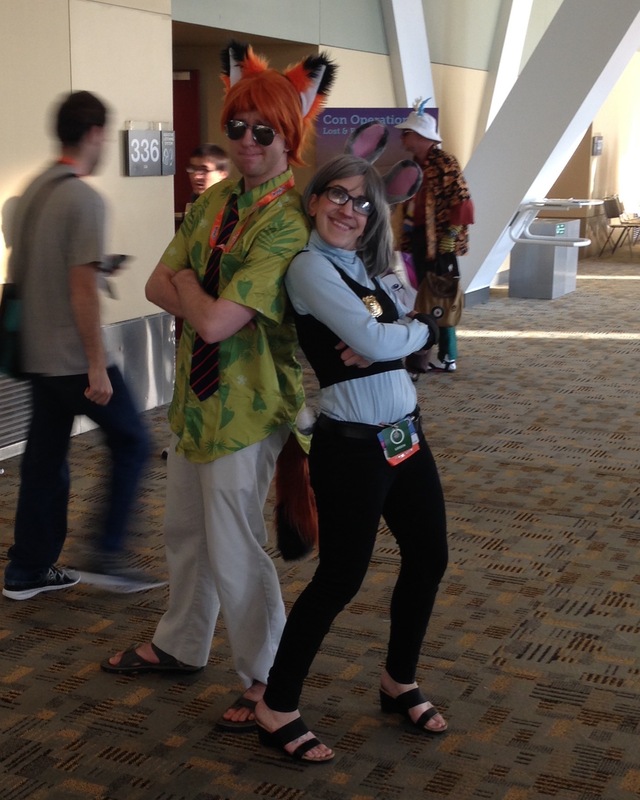 And ran into a lovely Judy cosplayer. Wew. Nice. Ran into the gang at AN so I was happy! If I don't die of exhaustion first it's going to be a great con! The Harry Potter Collection liquid lipstick is good, but expensive. You need to order it, I've never seen it in a store. Last year,I cosplayed X-Men Rogue,and I am going to cosplay Wonder Woman this year. I plan to wear my star trek uniform I wore last year. Though I could use some tips on how to prevent it from getting smelly since I'm not sure if my hotel, the Renaissance Baltimore Marriott, has a washing machine/dryer I can use. I want to wear it all weekend but don't want to stink up the place. So I decided to stick with my cosplay I have done every year, Big Sparkle (Metal Gear Twilight) I just don't have the time to put together something new. Working on a casual Daydream Shimmer cosplay! I ordered the pinafore from Darling Army, just need to craft the shoes and (possibly) wings! Going with a "casual" theme because I attempted to make the boots and they didn't work, and I don't want to try to make it look exactly the same as Daydream Shimmer and fall short. So I'm making it my own, glitterizing sneakers and using red eyeshadow to mimic her red mask. I'm excited!! I'm working on a Daydream Shimmer cosplay for my sister! She's gonna be wearing it on Saturday at the con! Maybe we will see you! how's Eren Jaeger looking so far? Might need a wig, or may dye my hair. What do y'all think? Which version will you be going as? Thinking of bringing my Fourth Doctor scarf and buying some brown pony ears for a closet cosplay.